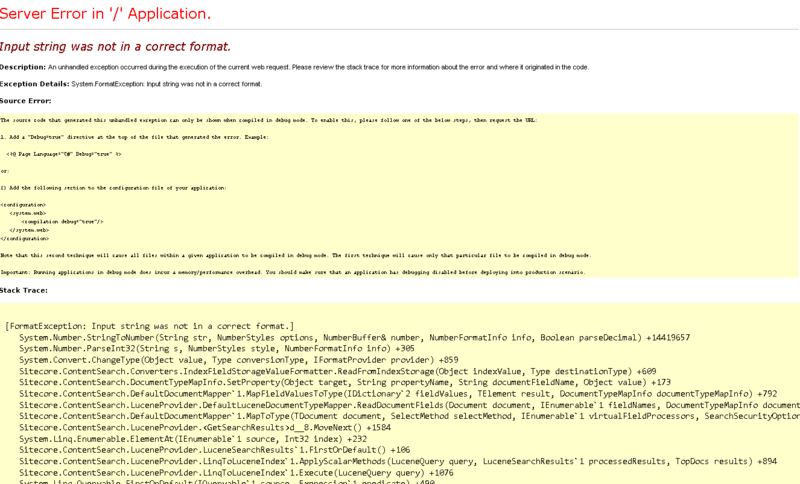 A System.FormatException is thrown when you run a Linq-to-Sitecore query. The source of the exception is System.Number.ParseInt32 or the likes. A Sitecore field which doesn’t contain valid numerical data is mapped to a numeric property (e.g. the field value “I have a horse” is mapped to MyClass.MyPropertyOfTypeDouble). A Sitecore Number field is being mapped to an integer property (e.g. the value 12.34 is mapped to MyClass.MyPropertyOfTypeLong). A Standard Values token used in a Sitecore Number or Integer field has been stored in the index (e.g. $MyStandardValuesToken is mapped to MyClass.MyPropertyOfTypeInt). The following is a brief sum-up of how I went about solving the issues outlined above; if simpler methods exist, please let me know! Well … fix your data. In short, Sitecore Number fields should be mapped to floating point properties like float, double and decimal whereas Sitecore Integer fields should be mapped to properties like int and long. To solve this issue, either change the Sitecore field type from Number to Integer or change the property it’s mapped to from int/long to float/double/decimal. Alternatively, it’s possible to explicitly mark properties with a TypeConverterAttribute, but doing so throughout a solution feels like treating symptoms instead of curing the disease. Neither the Sitecore.ContentSearch.FieldReaders.NumericFieldReader or the Sitecore.ContentSearch.FieldReaders.PrecisionNumericFieldReader are configured as the default for Sitecore fields of type Integer and Number, respectively. This means that e.g. Standard Values tokens like $GeneratedSerialNo will be added to indices as text and cause a System.FormatException as soon as Sitecore tries to convert said text to a number (e.g. when using Linq-to-Sitecore queries). Both the NumericFieldReader and the PrecisionNumericFieldReader return the value 0 when encountering field values which can’t be converted to numbers, hence avoiding invalid numerical data in Content Search indexes. Use the configuration described in a previous post to solve this issue for Sitecore fields of type Number. To solve this issue for fields of type Integer, insert the following into a .config-file and place it in a subfolder of “/App_Config/Include”, e.g. 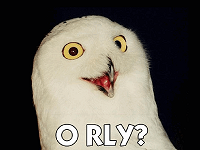 “/App_Config/Include/MyCompany/ContentSearch.IntegerFields.config”. Yellow Screen Of Death, why does thou haunt me so?